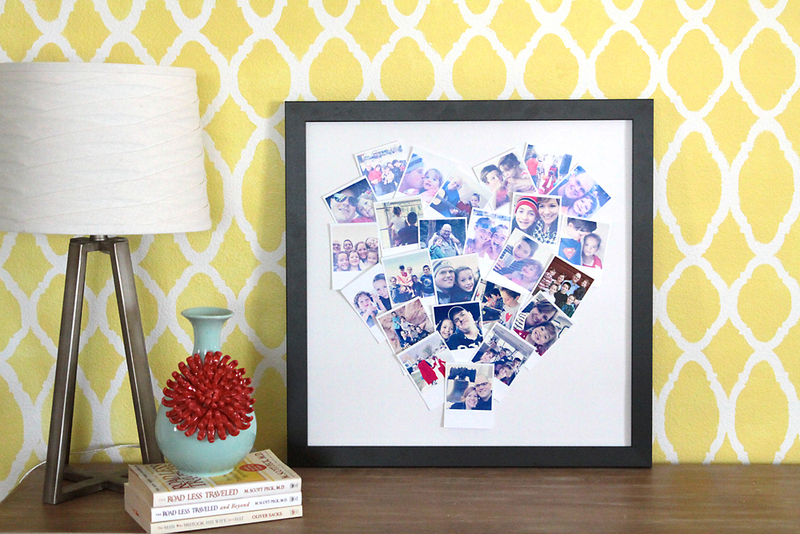 Nothing makes a gift or craft for your home more meaningful than a photo of the people you love , right? At least, that’s what I tell myself while I plaster photos of my family on candles and quilts and magnets and more. Working favorite photos into your home decor and craft projects is a great way to preserve memories, and photo gifts are always well received because everyone loves them! 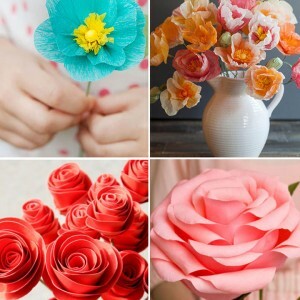 So today I am sharing over 40 different DIY photo crafts and photo gift ideas, so you can have plenty of DIY photo fun. Make sure to click on the link above each photo to be taken to the full instructions for that particular project, and let me know in the comments if you have ideas for other photo crafts or photo gifts you’d like to see! 1. 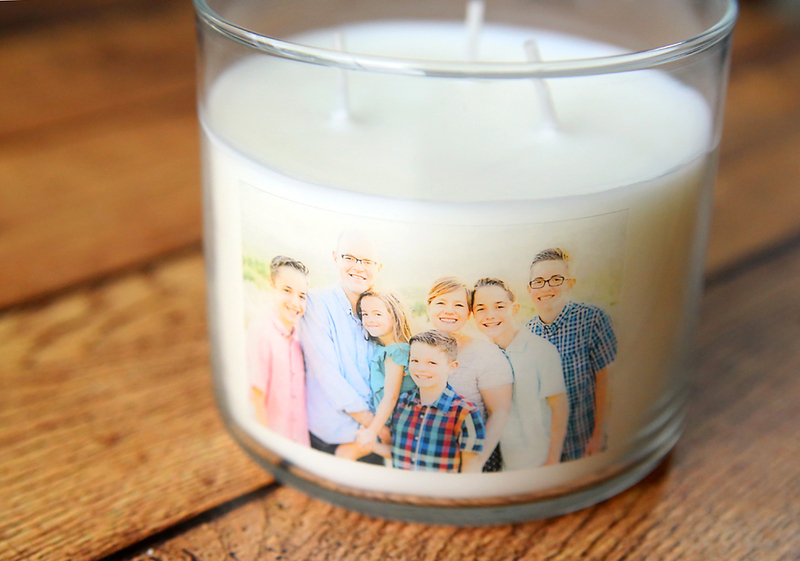 First is this personalized photo candle. You can transfer a favorite photo onto any glass surface with – wait for it – packing tape! A personalized candle makes a beautiful DIY gift, and at about five bucks it’s totally within the budget! 2. You can also transfer photos to glass using sticker paper, meaning you can make this glass photo block in about 5 minutes with your home printer. 3. This heart shaped photo collage is one of my favorite photo projects! 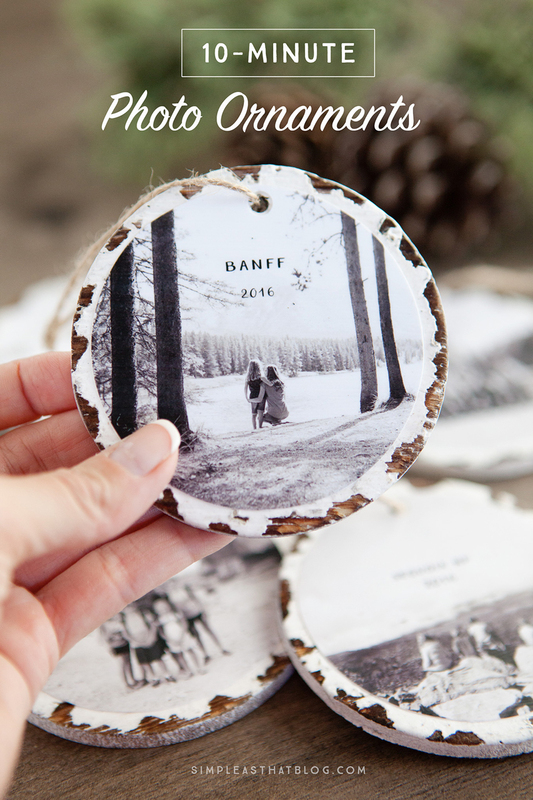 It’s a great way to showcase a mix of photos in a simple DIY gift. 4. 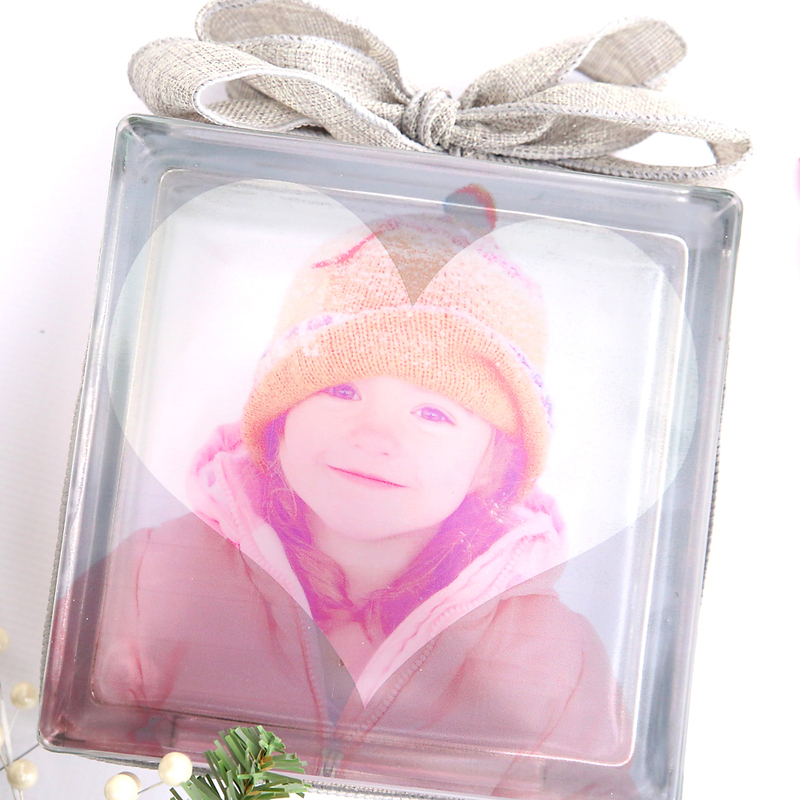 Another cool photo craft idea is photo keepsake ornaments, from Simple as That. Add a few photo ornaments to your collection every year for a truly special way to decorate your tree. 5. 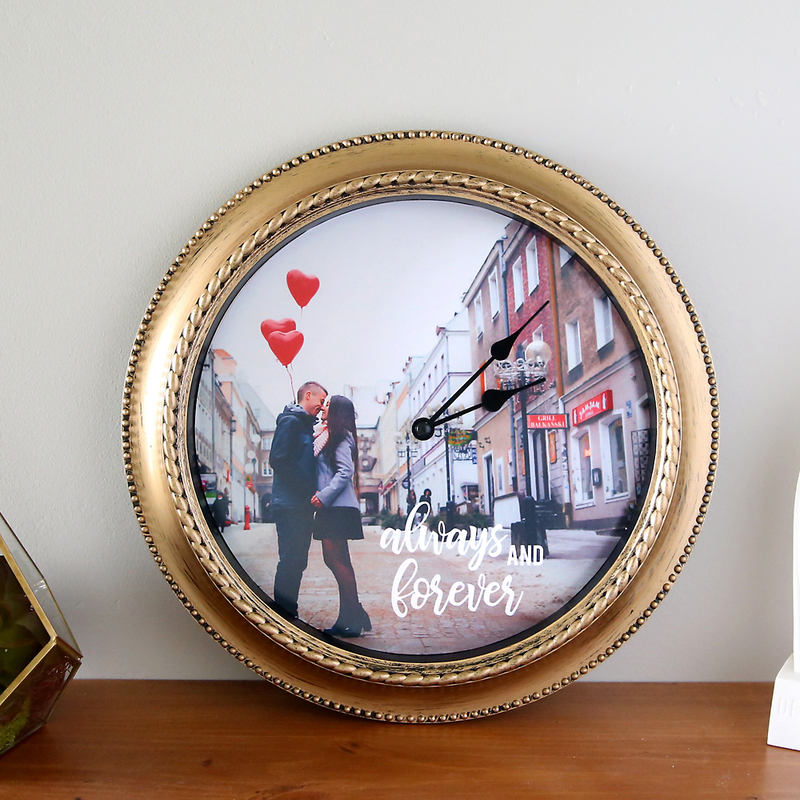 Turn an inexpensive clock into a memorable piece of home decor with this easy photo clock tutorial. This photo craft idea would make a great wedding gift! 6. 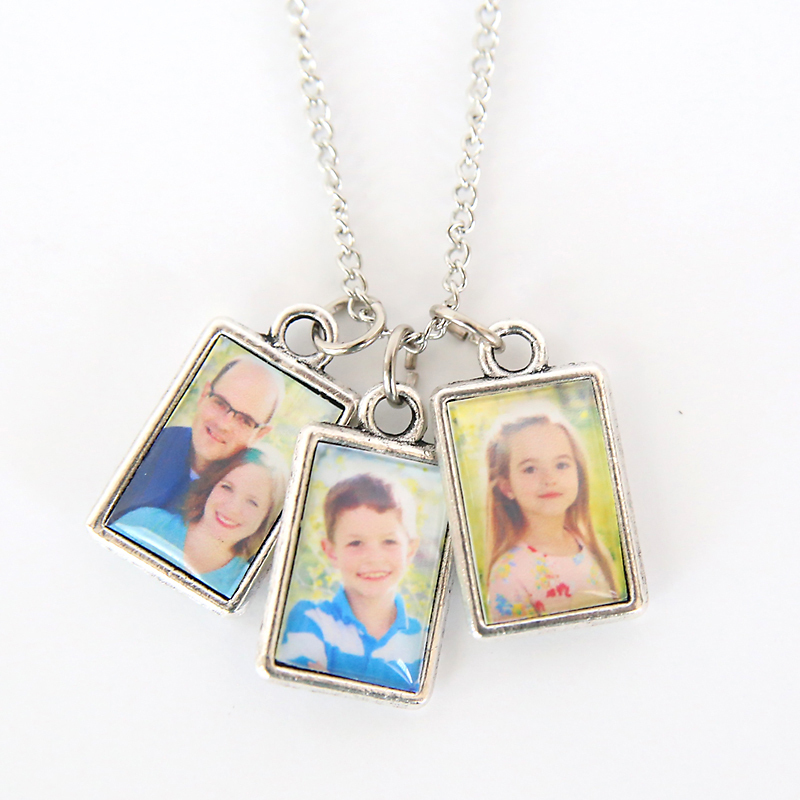 Keep special photos close with this easy to make photo necklace. It’s better than a locket, because the charms are double sided meaning you can wear 6 photos at once! 7. Learn the easiest way to transfer a photo to wood and make a pretty wood slice or wood plank photo. 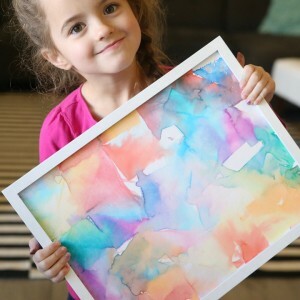 The wood grain shows through the photo, giving it a really cool look, and this method is super simple, with no transfer medium or messy paper removal required! 8. To make a special photo look even more special, learn how to turn a photo into a painting using Photoshop Elements. 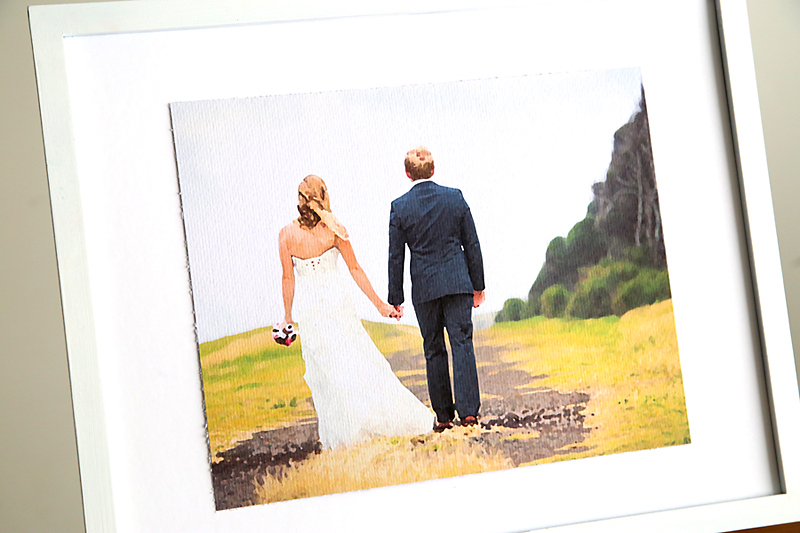 This photo gift idea is perfect for weddings or anniversaries! 9. 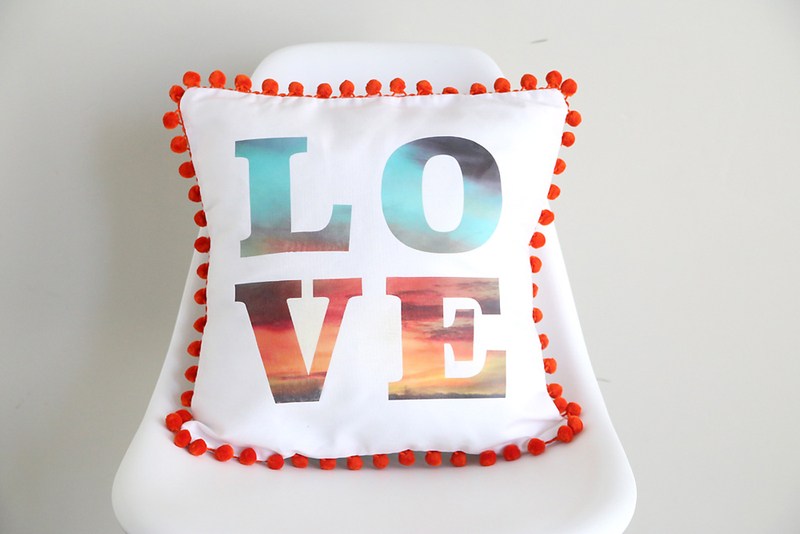 Remember a favorite destination with this photo text pillow tutorial, which shows you how to put a scenic photo into words which you then transfer onto fabric. 10. 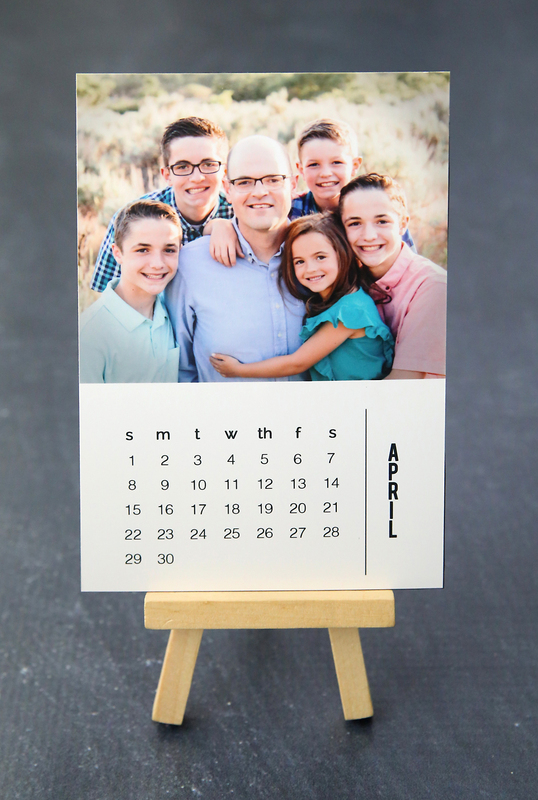 For a photo gift everyone will appreciate, make an easy DIY photo calendar! The instructions for this calendar come with free templates so you can print out the calendars and add your photos. You’ll even find directions for how to turn the photos into magnets. 11. 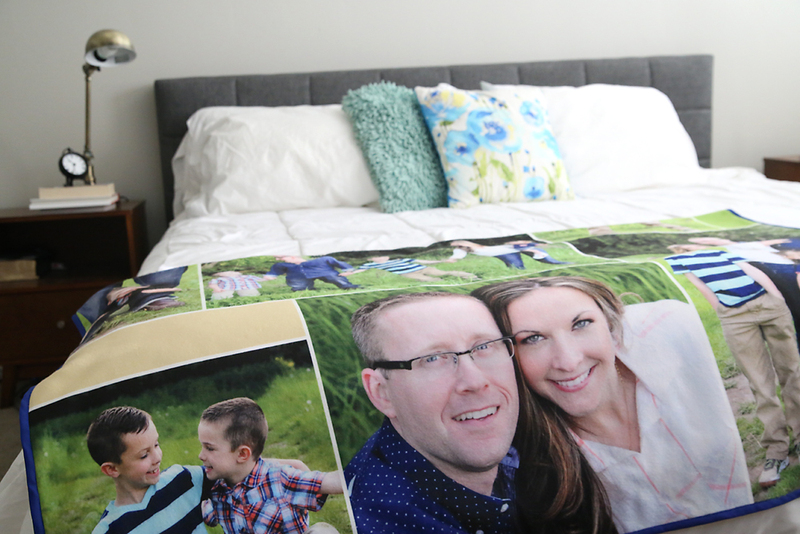 For an heirloom gift, consider making a photo blanket. 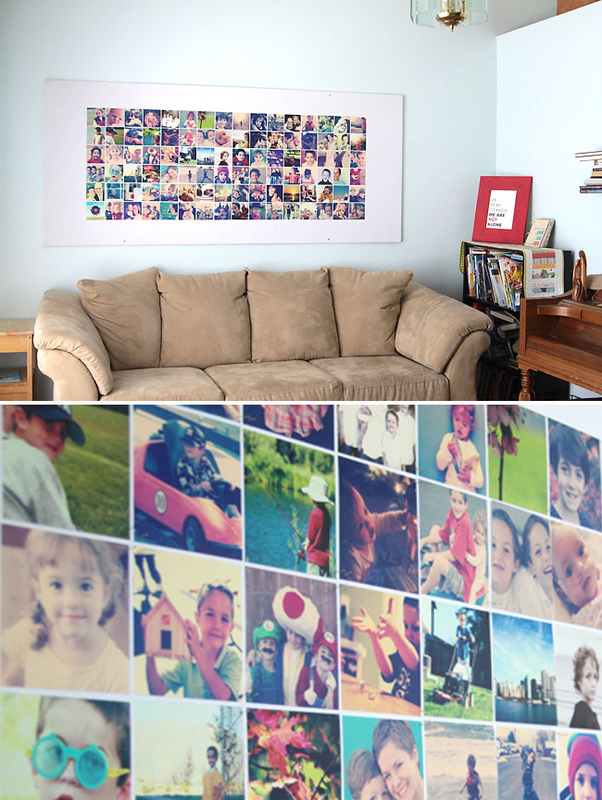 A blanket allows you to keep a number of favorite photos in a place you’ll see them every day! Click here for instructions on customizing your own photo collage and printing it on fabric, or check out Collage.com for an easy alternative. 12. Have you seen the tutorials that show you how to turn a large popsicle stick into a bracelet? 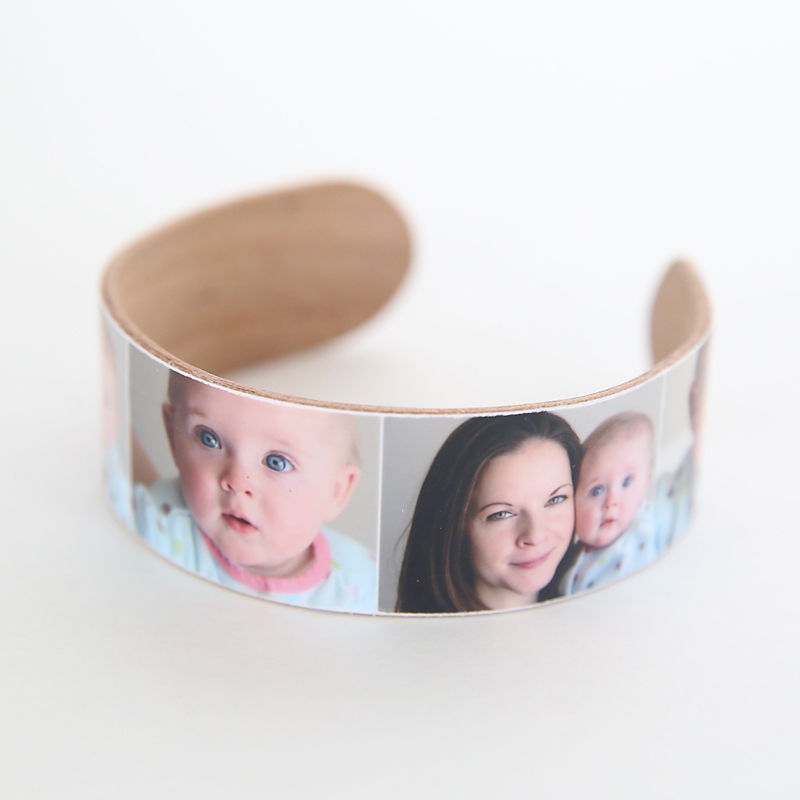 Well, this tutorial shows you how to add a strip of photos for a cute DIY photo bracelet. 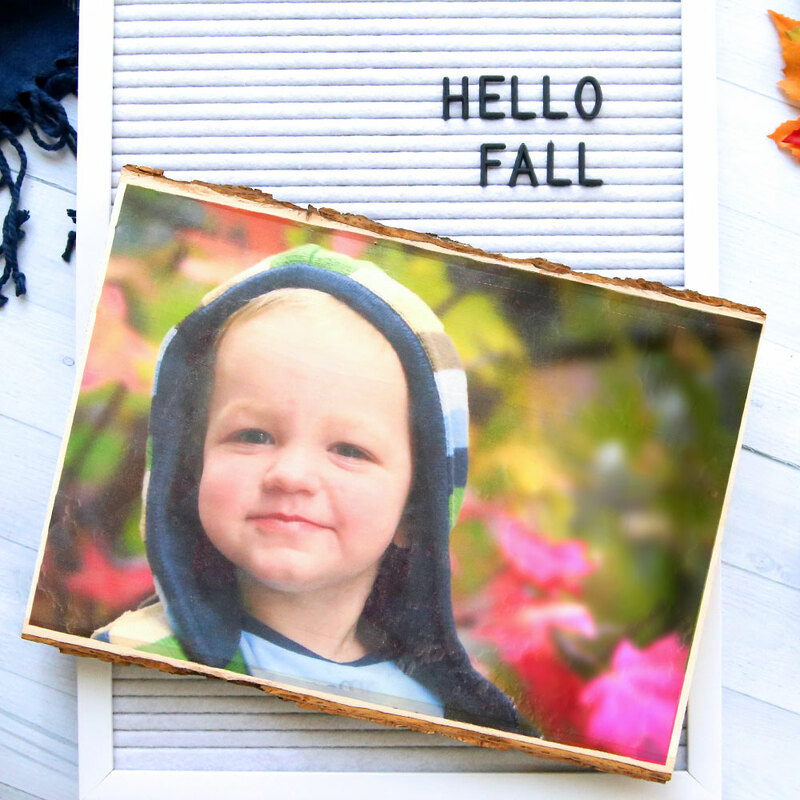 This photo craft would be a great one for kids to make for mom or grandma. 13. Here’s another fun photo craft for kids: use Photoshop Elements to turn your photos into personalized coloring pages! 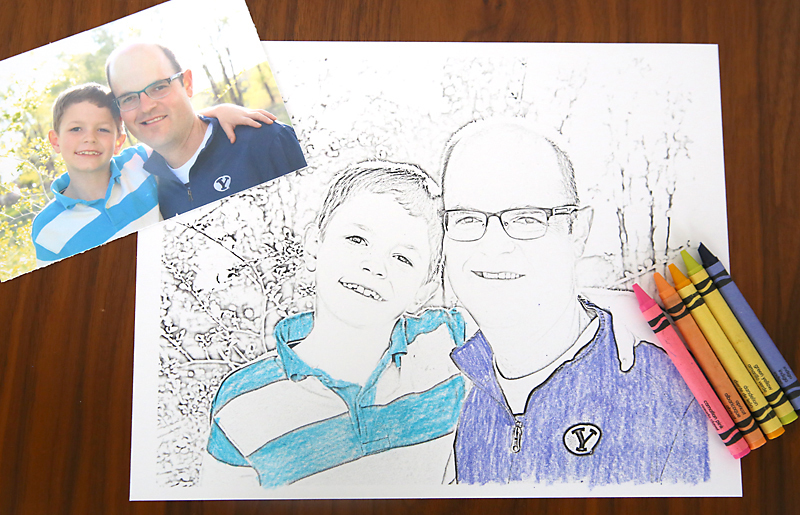 Kids will love getting to color in pictures of themselves. You could make a number of pages and put them together in a book for a really fun DIY gift. 14. 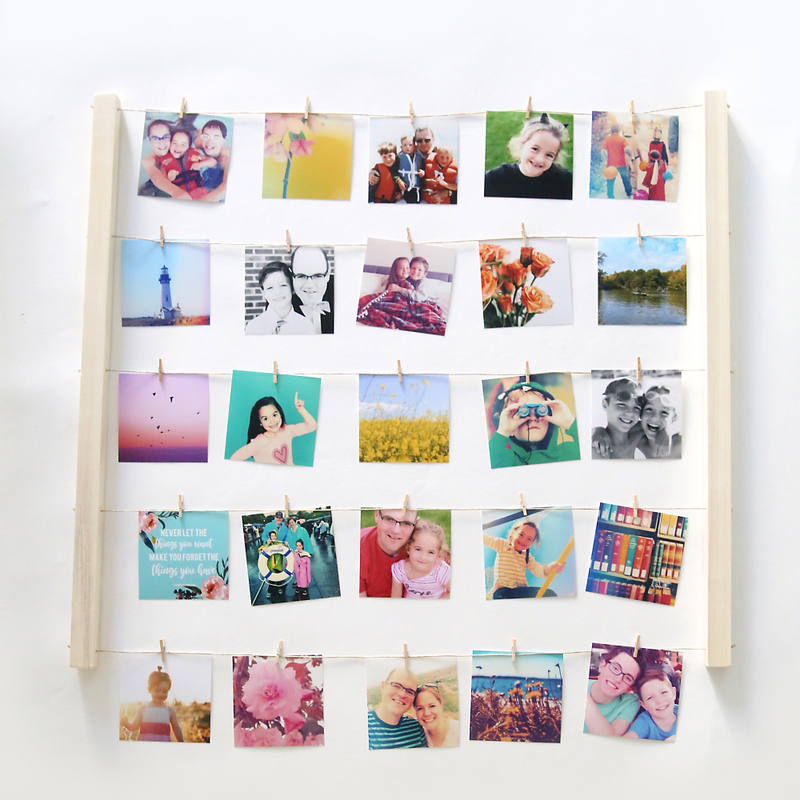 This clothespin photo hanger is a really easy way to showcase 20-30 of your favorite pictures. It’s easy to make with square dowels, some twine, and mini clothespins. 15. Make a pop art photo t-shirt using iron on transfer paper. 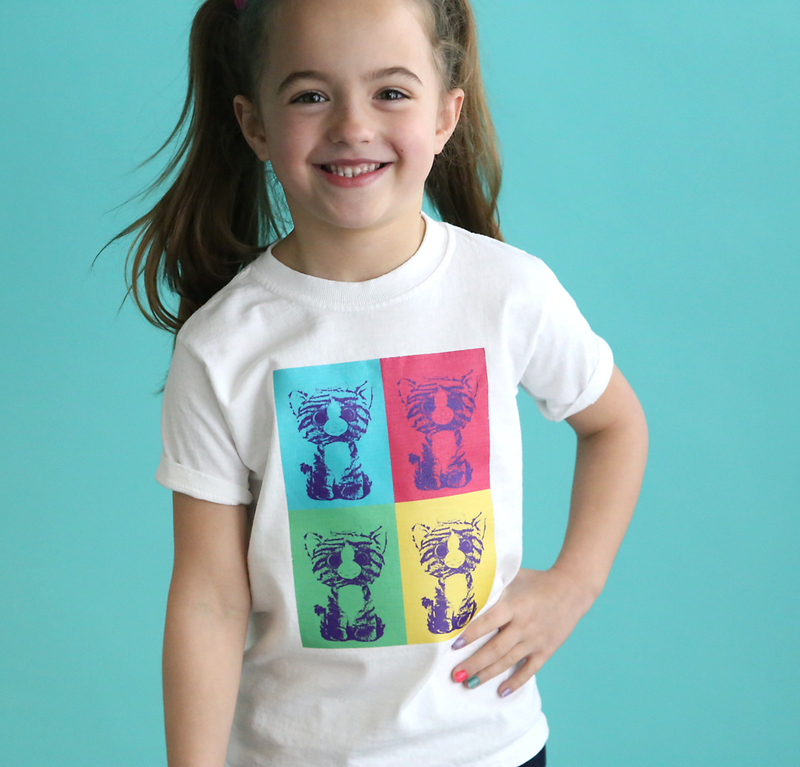 I made a tee shirt with a photo of my daughter’s favorite stuffed animal on it! 16. Learn how to make this giant picture collage bulletin board with a secret supply from the home improvement store that will only cost you about $15! 17. 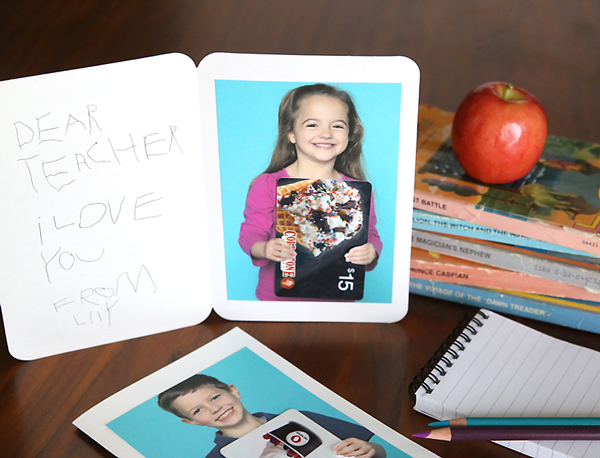 Make giving a gift card a little more special with these adorable photo gift card holders. Click through the link for full instructions for this photo craft. 18. 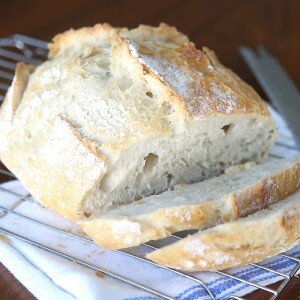 The photo luminaries from Our Best Bites are made with vellum and turn out so pretty. 19. 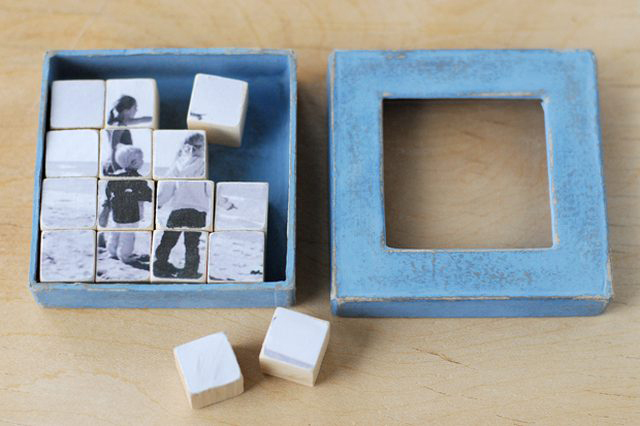 Check out this tutorial for making a photo puzzle box. This would make a great Christmas or birthday gift for the kids in your family. 20. 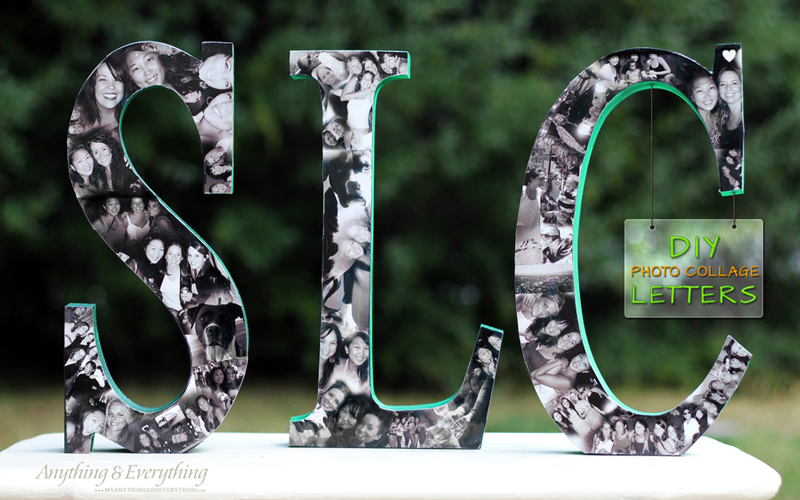 These photo collage letters from Anything & Everything would be so much fun to make! 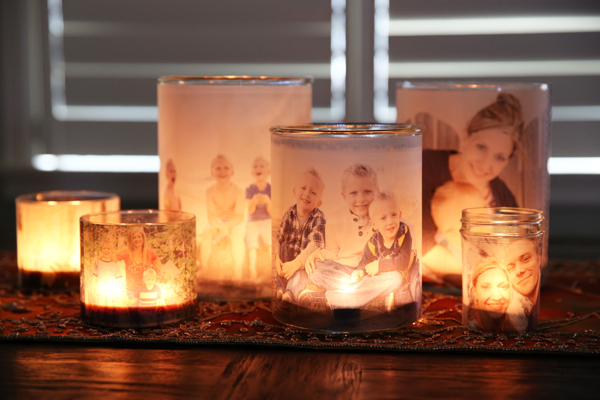 Ok, that’s the first 20 photo crafts, now click here for 20 more DIY photo craft ideas, including photo coasters, a photo covered lamp shade, a photo frame memory wreath, photo phone case, and more! 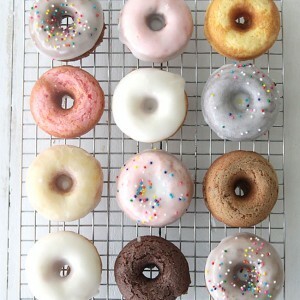 Want even more photo ideas? Click here for 20 handmade photo frame ideas, and click here for 20 cool photo display ideas. And don’t forget to check out the photography archives for over a hundred photography and photo related tutorials!